Wayne Rhoden, 74, of Garrison, passed away Friday, September 7, 2018, at the Southern Ohio Hospice Center in Portsmouth, Ohio. He was born December 7, 1943, in Greenup County, a son of the late Joe and Thelma Royster Rhoden. Wayne was a member of the South Shore Church of Christ for 38 years and was a lifelong farmer. He enjoyed hunting, fishing, farming and spending time with his family, especially his grandchildren. In addition to his parents, he was preceded in death by two brothers, Hershel Rhoden and Rufus Rhoden and one sister-in-law, Carla Rhoden. 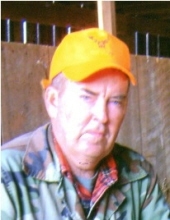 Wayne is survived by his wife of 51 years, Margaret Madden Rhoden; two sons, Richard Wayne Rhoden and Adam Rhoden (Peggy Sue) all of Garrison; two grandchildren, Wesley Rhoden and Roseann Rhoden; three great grandchildren, Riley Ann Rhoden, Addison Belle Rhoden and Kelsie Lynn Rhoden; six brothers, Marshal Rhoden (Marcella) of Greenup, Virgil Rhoden (Kathy), Ronnie Rhoden (Velma), David Rhoden (Patty), Zandel Rhoden all of Garrison and Billy Jo Rhoden of South Portsmouth; one sister, Ruth Moore (Robert) of Garrison; and sister-in-law, Tiny Rhoden of Garrison. He also leaves many other family members and friends who will sadly miss him. Funeral services will be held at 12 noon Monday, September 10, 2018 at Globe Family Funeral Chapel in Garrison with Brother Lonzo Horsley officiating. Burial will follow in the Rhoden Family Cemetery in Greenup County. Friends may visit from 10:30 a.m. to 12 noon Monday, September 10, 2018 at Globe Family Funeral Chapel, 103 Dudley Avenue, Garrison 41141. In lieu of flowers, please direct donations to the Southern Ohio Hospice Center in Portsmouth, Ohio.